If you graduated (all US Military Services and civilians) from UWSS, were a staff member,at the UWSS Key West FL, you qualify to be a member! Associate memberships (non voting) only be a members recommendation. Will somebody please send me a better copy of this picture! "It pays to be a Winner!" Native Born and Bred Texan , and PROUD of It! NOT A Yes Man. Semper Fi ! HooYah! by R.D. Russell (SEAL) & Pam in Ft. Collins, CO.
" Let every nation know, whether it wishes us well or ill, that we shall pay any price, bear any burden, meet any hardship, support any friend, oppose any foe, to assure the survival and the success of liberty. This much we pledge - and more. To those old allies whose cultural and spiritual origins we share, we pledge the loyalty of faithful friends. United, there is little we cannot do in a host of cooperative ventures. Divided, there is little we can do - for we dare not meet a powerful challenge at odds and split asunder." Stephen "Otter" Otten SEAL volunteers to be jailed in Santa Anna CA. E. Koch and Nathan H. Hardy (SEALs) KIAs HERE ! LCDR LINDA BALL's Photo ALbum, The best looking diver in the U.S. Navy ! CPO Mark T. Carter (SEAL) KIA in Iraq, Dec 2007; A Blog for him here. Michael P. Murphy, MOH awarded posthumously. See the VIDEO! "SEAL JAVA Webs" by "Nightscribe" Mr .Rich Young God Bless him. Thank you very much for all your tributes to the U.S. Navy SEALs Links. LEWIS & MC RILL (SEALs) KIA by I.E.D. Also DAUGHERTY, cryptologic tech. 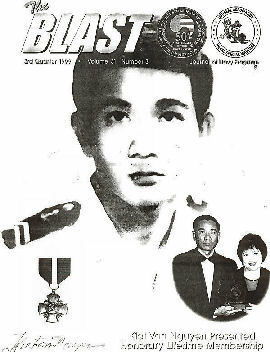 Petty Officer Nguyen Van Kiet : Vietnam War: “It was their country. They deserve respect.”When Hollywood made a movie about the dramatic rescue of a downed American pilot during the Vietnam War, it left one man out: the South Vietnamese navy officer who was a key member of the rescue team. note: the two links I had were removed from the internet, xin loi ! Mr. Steve Schwarzer ABS Master bladesmith since 1983; Need a GREAT Knife? Steve Elson LCDR (SEAL) Ret. Auto Assault 12 / AA12 / Combat Shotgun check out this video ! Veterans Stand Guard Before Dietz Statue Unveiled . Photos are HERE. SEAL 160 Ride Video and their Web PAGE photos of the ride. U.S. Navy Commander (Ret.) Larry Geisinger 34 year Vet. TONS! of SEAL and Specwar photos HERE ! Navy SEALs.com nice small store. HM3 (FMF) SEAL's Son KIA Iraq: C. Anderson another Photo of Chris HERE. Eric Crandall completes BUD/S, Contratulations! The only easy day was yesterday ! HooYah! AO2 (SEAL) Marc Alan Lee, 28, died during a firefight Aug. 2 in Ramadi, Iraq, More HERE! Gen.Patton speaks from his grave. Capt. Norman Olson (SEAL) Ret. Chuck Newell's (SEAL) SCUBA School, GI bill accepted! Fred Miller (SEAL) GunSmith "MidAmerica Recreational INC."
F.O. UWSS Key West FL & the official site HERE! Site Map The whole enchilada! not current. XinLoi! RUDY BOESCH in SURVIVOR ALL STARS - More HERE! Dave Rogers (SEAL) "Just Cause"
Vietnam Retspect by VC Col. The Hunt Heats Up The man in charge of catching Osama bin Laden 'can drive a knife through your ribs in a nanosecond.' Inside the search. Jon Edwards class 28 East Coast. Larry Lyons, "On The Road Ministry"
Forty-three SEALs were killed in action in Vietnam, but none were captured or went missing. Dockery attempts to cover all this ground, managing to touch on ... More HERE on USNavy SEALs. good reading. Famous USNavy SEALs and much more, is your name HERE? Does Coronado California Train Killers? Blackwater Articles Blackwater web site; Mr. Prince Speaks; . . . . . . Mr.Prince on the Investigation Mr. Prince fires back at Congress ! WAR Toys for Sale ! Jesse Hardy says he got SCREWED!Jesse Hardy says he got SCREWED! in the early years of the birth of the "BUD." Officers wore a Gold color version in UDT. IF you wanna buy one go HERE! 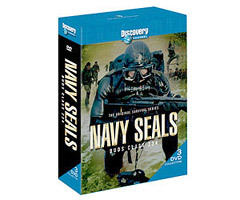 the NAVYSEALS.com Store. tell them Doc Rio sent you for you 00% discount. The Largest SEALs Photo Album in the entire WWW: No Joke ! some people say; "I am wasting my money!" I would not do it if I could take it with me! hey click on me ! Squad -- The smallest military unit, it usually consists of 10 to 11 soldiers. Platoon -- A platoon is usually four squads. Platoons are usually led by lieutenants, with sergeants serving as their second-in-command. Company -- Companies consist of four platoons, a headquarters and some logistical staff. They are normally commanded by captains. Battalion -- A battalion is usually made up of four to five companies, including a support company and a headquarters company. Brigade -- A brigade is a collection of battalions, usually 2,000 to 3,000 troops. Brigades are most often commanded by a colonel. Division -- There are at least three brigades in a division. They are usually commanded by a major general. Corps -- Made up of two to five divisions, corps are the largest tactical units in the U.S. Army. The Marine Corps, a branch of the Navy, has some unit classifications that are unique. Marine Expeditionary Force -- An expeditionary force is made up of two or three divisions of Marines. The force is usually deployed on helicopter carriers or amphibious assault ships. Its equipment and weaponry includes tanks, artillery, Harrier jump jets and attack helicopters. Marine Expeditionary Unit -- Each marine division is known separately as a Marine Expeditionary Unit. The unit usually includes a battalion landing team, helicopter squadron and support unit. This LINK for you "Old Salts" who graduated from the U.S.Army's Ft. Benning Parachute Training School. You may still remember the song. We must reserve the right not to tolerate the intolerant tollerant. Houston, TX USA and PROUD of It! Working together, we find solutions. As one, ALL give a forceful voice to people rarely heard. Have you ever been to Dong Tam on the MyTho River in Vietnam? click on LINK ! It was Bob "Eagle" Gallagher , I and others who got wounded in the wargames 'nam, we each got MedEvac helicopter rides into DONG TAM"s U.S.Army's MASH hospital. Dong Tam was a few miles from MyTho where we were living in the Hotel Carter Billet. I was not seriously wounded, so I wanted to go home. Lt. Pat Patterson (SEAL) visited me but he would not help me escape so the next day I stole some clothing from their Medical Officers cloths line, and I hitched hiked a ride to MyTho. I could not find shoes that fit me so I wore hospital slippers. DaiWee Pete Peterson(SEAL) said that he would keep me out of trouble and I responded, "what can they do, sendme to Vietnam?" Good old days when SEALs were the "Beer/Whiskey Generation." "Make Love and War!" On 25 June 1950 Communist backed North Korea invaded the Republic of South Korea. The United Nations designated a U.N. Command, led by America's General Douglas MacArthur, to help South Korea. Participating countries, mainly the U.S., started sending troops. Units from all five U.S. military services were eventually involved, and included one Marine division, and several Army divisions. The Communist invasion pushed South KoreanForces, and early arriving U.S. and other U.N. troops to the southeast corner of the country at Pusan by August. Navy Hospital Corpsman James Crow, 18-years-old, was stationed at the Naval Hospital, Oakland, California, when transferred to the U.S. Marine Corps 1st Marine Division in Korea. He arrived October 1950, turned 19 that same month, and came home September 1951. The 1st Division assigned Crow, along with 21 other Navy Corpsmen, to spend his tour assigned to the tough, elite and highly respected South Korean Marine Regiment attached to the division. The first 15 months of the war saw heavy action, and the 1st Division was in the thick of many operations, working alongside Army divisions in X Corp. In August 1950, during the fighting at Pusan, all three separate Korean Marine Battalions were organized into the 1st Korean Marine Corps Regiment (Hae Pyon Dae), and attached to the U.S. 1st Marine Division 05 September 1950 for operational control. Thereafter, the ROK Marines performed 1st Division combat activities. During this conflict, foreign media dubbed the [Republic of Korea Marine Corps] the 'Invincible Marines' after an incident in which a squad of ROK Marines wiped out an entire battalion of Communist forces. The ROKMC also saw action during the Vietnam War while stationed in DaNang. | From: VFW Magazine | Date: August 1, 2003 | Author: Van Ells, Mark D.
The Korean War was a crucial moment in American history. When the United States sent troops to stop Communist North Korea's invasion of South Korea in June 1950, it signaled the nation's determination to check the spread of communism. It was the first war fought under the authority of the United Nations. American troops remain in Korea today. But sandwiched between the titanic scope of World War II and the vitriolic debate over Vietnam, the Korean War never really captured the public imagination. The year 2003 marks the 50th anniversary of the armistice ending the fighting in Korea. In that half century, the image of the Korean War veteran at the movies and on television remains vague, imprecise and influenced by the experiences of other wars. The Korean War is the "Forgotten War" in popular culture, too. Korean War films of the 1950s and early 1960s were much like the scores of WWII movies popular at the time, but modified to meet the realities of Korea. The typical "melting pot" platoon, for example, now included black Americans and those of Japanese ancestry, acknowledging the racial integration of the armed forces. New technologies also made appearances, such as helicopters in Battle Taxi (1955) and jet aircraft in films like Sabre Jet (1953), Jet Attack (1958) and most notably The Bridges of Toko-Ri (1954) based on the novel by James Michener. In reality, the Korean War differed from WWII in many respects. For one, it was not nearly as large. The war directly involved 1.8 million Americans, as opposed to the 16 million who served in WWII. Indeed, Korea was often referred to as a "police action" and not a war at all. Korea was a remote country unknown to most Americans. Although most Americans accepted the logic of Cold War containment, the primary adversary in their minds was the Soviet Union; Korea seemed to be merely a sideshow or prelude to a larger war. Its ambiguous conclusion--a cease-fire remarkably close to the prewar boundaries--also lacked the decisiveness of WWII. To Americans, the Korean War was an uncertain and unsatisfying affair. Hollywood dealt with the ambiguities of the war by sidestepping them or ignoring them altogether. Korean War films tended to avoid the war's "big picture" and focused instead on small groups of fighting men--often lost or isolated units--in films such as Fixed Bayonets (1951), Combat Squad (1953) and Hold Back the Night (1956). In Pork Chop Hill (1959), Gregory Peck stars as a junior officer fighting the military bureaucracy, as well as the Communists, in a seemingly meaningless battle late in the war. During the battle one young officer asks pointedly, "Is this hill worth it?" The men agree that it is, but only because they had fought so hard to take it, and not for any larger goals. Many Korean War films fall into the film-noir style that was popular after WWII. Film-noir is characterized by dark psychological dramas in which the motives and morals of the protagonists are unclear and troubling. These films often take place in exotic settings, and contain shadowy lighting and uncomfortable camera angles that elicit feelings of anxiety, loneliness and vulnerability. In the 1951 film The Steel Helmet, for example, Gene Evans stars as Sgt. Zach, a battle-hardened WWII "retread" who teams up with some inexperienced soldiers to establish an observation post in a Buddhist temple. But beneath Zach's tough-as-nails exterior is a softhearted man who befriends a Korean boy, removes his helmet before a gigantic statue of Buddha and orders that the temple not be damaged. In the midst of battle, Zach breaks down, flashing back to D-Day. Zach is bitterly critical of a green lieutenant. When the lieutenant is killed, Zach mournfully places his lucky steel helmet (it has stopped a bullet in a previous engagement) on his grave. The Korean War also took place at a time when fears of disloyalty and domestic subversion had reached hysterical proportions. The war fueled such fears. During the war, the Communists beat and tortured American POWs, and then pressured them to sign "confessions" denouncing the American cause. Only a small fraction of POWs "confessed," but news reports and political opportunists seemed to suggest that Korean War soldiers routinely collaborated with the Communists, perhaps contributing to the war's uncertain conclusion. The concern that Korean War veterans might have been "brainwashed" by the Communists was the subject of several films, most notably The Manchurian Candidate (1962). Frank Sinatra plays Capt. Marco, a Korean War officer who leads a patrol and is taken prisoner. The Communists brainwash Marco and his men, erasing any memory of their captivity. One of the men, Staff Sgt. Shaw (Lawrence Harvey), is programmed to carry out political assassinations back home. Marco unravels the plot after the true nature of his captivity comes back in his dreams. The Manchurian Candidate has been acclaimed as one of the best political thrillers ever made. However, Korean War veterans have charged that the film only reinforced the erroneous public notion that Korean War veterans were collaborators. Portrayals of the war's veterans as weak-minded and psychologically unbalanced came to symbolize the war for many Americans and anticipated public perceptions of Vietnam veterans. The Vietnam War also has shaped popular images of the Korean War. The 1970 comedy classic M*A*S*H focused on the exploits of undisciplined Army surgeons near the front lines. Though set in Korea, the language and looks of the hospital staff are reminiscent of Vietnam. In fact, the film is an impressionistic journey into the behavior of men and women under the unusual circumstances of war. It reflected the growing public cynicism about military authority in the Vietnam years. The television program M*A*S*H, which aired from 1972 to 1983, was the most extensive look at the Korean War in American popular culture. The TV show did a better job of portraying the war than the film. For example, several episodes dealt with issues like McCarthyism and fears of subversion. However, most of the program's storylines could have come from the Vietnam War, or from any war--boredom punctuated by intense activity, the tragic tales of the wounded, the absurdities of bureaucracy, the gulf between soldiers and civilians. Anyone who has ever been associated with the military can appreciate the humor of M*A*S*H. But once again, the audience learns precious little about the Korean War. In the decades since Vietnam, the American entertainment industry has devoted considerable time and money to portrayals of war. As a nation, we have celebrated the 50th anniversary of WWII (Saving Private Ryan, Band of Brothers) and reexamined our painful experience in Vietnam (most recently, We Were Soldiers) on both the big and small screens. Korea is once again missing in action. Since Vietnam, Hollywood has released no more than a dozen films related to the Korean War. In some films, like MacArthur (1977) and For the Boys (1991), Korea is just one of many conflicts depicted. Inchon (1981), a portrayal of the brilliant 1950 amphibious invasion, was a box office flop and labeled by one critic "quite possibly the worst movie ever made." With no clear public images of the Korean War, both Hollywood and the American public barely acknowledge it. The lack of public recognition for their sacrifices has rankled many Korean War veterans. "I know teachers who never knew there was a Korean War," complained one Missouri veteran. As the nation marks the Korean War's 50th anniversary, Hollywood continues to churn out movies about WWII and Vietnam. Perhaps one day the Korean War will be the subject of an insightful, widely circulated film that does justice to the significance of the conflict and to those who served in it. As one veteran from Florida noted, "It's nice to be remembered." MARK D. VAN ELLS, author of To Hear Only Thunder Again, is an assistant history professor at Queensborough Community College in Bayside, N.Y.
"Doc" Riojas' HELL Weeks were in Korea ! Too many to count ! Have you seen some of the pictures on my UWSS Key West Web Site? to see them go HERE! Click Here - a little music to keep you company while you visit. Iconize the jukebox and surf on.. stop music any time you want or restart and rock - or - as we all need to - pray for our nation - spend a little time with our Creator.